Super heros CAPTAIN AMERICA and THOR are a new release for 2011. 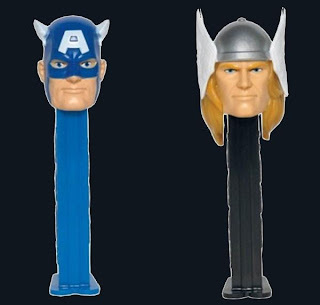 These characters were first issued by Pez back in 1978. Renewed interest in these characters is on the horizon due to a new THOR movie is set for release in May and a new Captain America movie is set for release in July. Both PEZ are reportedly showing up NOW at Toys R Us.